Many people have asked for more tutorials using Google’s suite of products. One prominent question is “how does VLOOKUP work in Google Sheets?”. This function is hugely popular among Google and Microsoft spreadsheet enthusiasts. In this example, I’ll show how to get started. (Includes resource spreadsheet). — If you’re an Excel user, please check out the Excel VLOOKUP tutorial. What is a Lookup Function? If we remove the concept of spreadsheets, you probably do a similar function when you go to a restaurant. You scan the menu for some tasty options and prices. And just as you come to the end, there’s a reference to “daily specials”. Now, you have to hunt for where those items are. The same issue happens with data. Instead of menus, you might have multiple worksheets from different sources and the data isn’t always organized the way you want. In the picture below, can you guess what is a Pcode? It’s a code that represents the voter’s political party. You wouldn’t guess that unless you saw a related spreadsheet with additional information. Below you can see the value in Pcode is the same as the value in PARTY CODE. 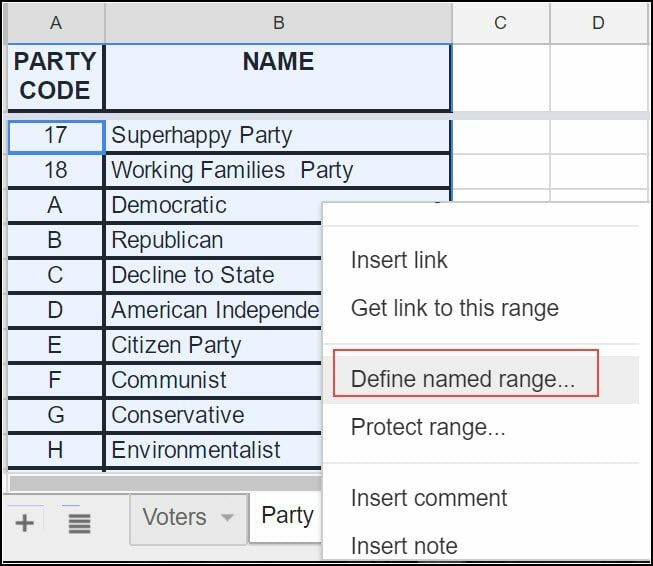 What would make more sense is to add a column to the first worksheet that displays the political party name from the second worksheet. 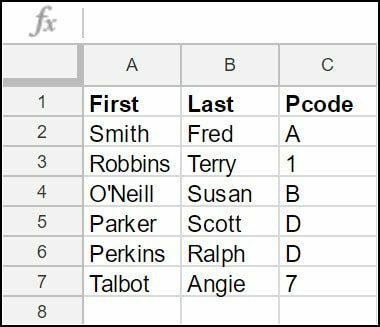 Using named ranges and the vlookup function, we can improve the table. When building the lookup, it helps to define what you want and where the values are located because of the column order. 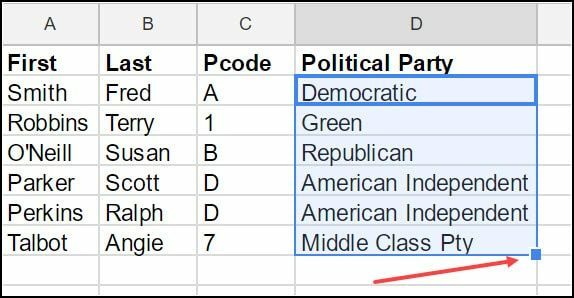 Stating it another way, for each voter, we’ll grab their “Pcode” and search for a matching value in the “PARTY CODE” column on the other worksheet. If we find a match, we’ll look in the “NAME” column and copy that value to the voter’s “Political Party”. Before we begin, there are several important rules to know about the reference column you need to look up. 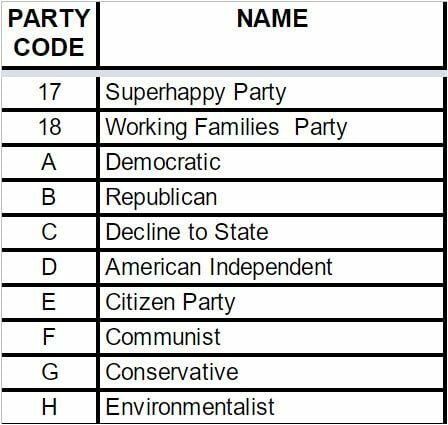 In our case, this will be the PARTY CODE column on the Party Codes worksheet. The PARTY CODE column must be the left-most or first column. The PARTY CODE column values must be unique. The PARTY CODE column should be sorted. For example, I shouldn’t have the PARTY CODE column with multiple instances of the letter “A”. And as you’ll see in the sample file, the values in this column are sorted starting with numbers and then letters. To make this tutorial easier, I’ve created a sample spreadsheet. You can right-click it and choose Save link as…. Open a new Google sheet at https://sheets.google.com. Upload the sample tutorial file referenced above. Select the Replace spreadsheet radio button. If you’re not familiar with a named range, it’s a way of defining a cell range using meaningful names instead of absolute cell references. This becomes very handy when you reference ranges in formulas. Instead of having a reference like 'Party Codes'!A2:B45 we can use a named range called PartyTable. Press Ctrl + A or command ⌘ + A to highlight the range. Right-click and select Define named range…. You may have to scroll a bit to see this option. The Named ranges dialog will appear on the right. Change the name to PartyTable and click Done. The VLOOKUP function has 4 arguments. The last item, Sort_order is optional but critical. This TRUE/FALSE value specifies our matching precision. By default, Google will use a TRUE value which means it will match on a close value. That’s probably not a good idea when it comes to politics. Search_Criterion Which cell do we lookup? Array Where should we look for the values? Index Which column number holds the value we need? Sort_order Should we use “close match”? 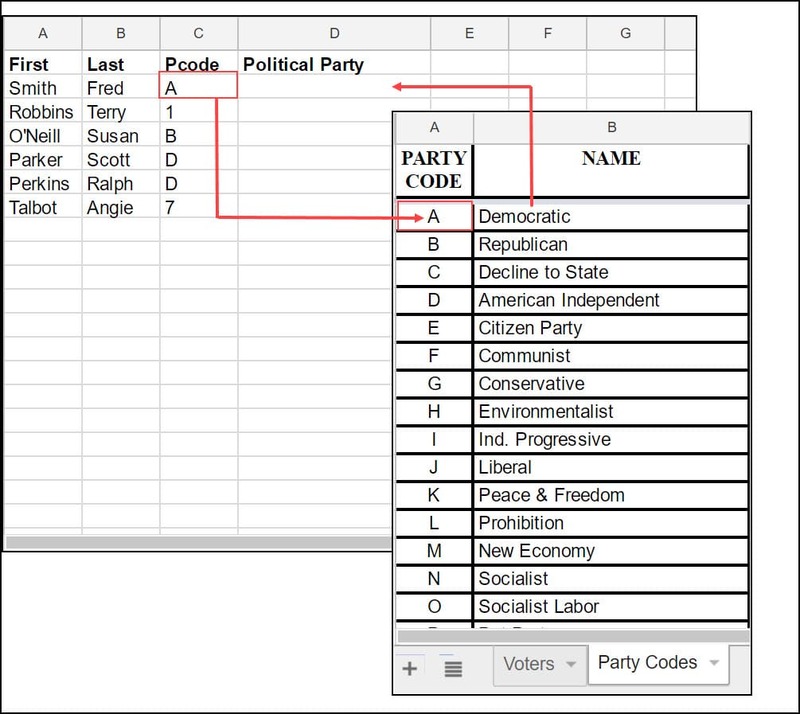 On the Voter’s tab, add your Political Party column in column D.
Start typing =vlookup. You may prefer to use the formula bar above the column headings as it has more visible room. You can click the small blue question mark for online help. After the opening parenthesis, we’ll click cell C2. This is our “Search_Criterion”. Type a comma to separate our arguments. Type PartyTable. This Named Range is our “Array”. Type 2. This is our “Index”. We’re telling Google to search for the values in the 2nd column on our Array. Type FALSE. This is our “Sort_order”. The FALSE means we want an exact match. In the example above, Google Sheets shows the lookup value of “Democratic” in the formula bar. This indicates the formula found a lookup value. Click Enter to commit the function. Click and drag the sizing handle (blue square) on D2 down the column to copy the formula to the other cells.